After a few months of additional exploratory graphic novel reading, I’m finding myself more compelled than ever to make a case for this genre in the classroom, and to back up my initial desire to expand my knowledge about this burgeoning book form with not only my own observations, but the evaluations of educators and experts who have first-hand experience watching the graphic novel enhance students’ comprehension in schools and libraries everywhere. Please have a look at my findings below, and get a systematic overview of the WWWWWH (who, what, where, when, why, and how) of graphic novels! works – poetic language, complex characters, and the like – with modernity – images, which with the media, have become another intrinsic part of our current milieu, and even the web as grounds for publication – it is only natural that we latch onto them. As Gretchen Schwarz, who earned her doctorate in secondary education, and who teaches college courses on media literacy in curriculum, notes in her chapter, “Graphic Novels: New Sites of Possibility in the Secondary Curriculum,” “Students need a new kind of curriculum in the Digital Age, new sites of possibility for learning and creating knowledge. One medium that offers such a site is the graphic novel. The graphic novel can drive current traditional curriculum goals, teach new literacies, offer new topics with which teachers and students can engage, and enable new ways of learning” (Schwarz 53). While students outside of school fill their leisure with text messages, Facebook perusing, music downloading, blog reading, Wikipedia searching, and so forth, schools seem to be attempting more and more to hark on the old forms of print and spoken media, at the expense of helping students to learn how to correctly navigate these newer forms of media. As Palfrey and Gasser, two professors of law at Harvard and University of St. Gallen, respectively, and authors of Born Digital: Understanding the First Generation of Digital Natives, put it: “Our challenge is to help them make sense of these new contexts and new meanings, and to think synthetically and critically, rather than letting them lose their way” (Palfrey and Gasser quoted in Schwarz 56). In the classroom, educators can use recognized graphic novels as a literary way to help enhance traditional and imagistic literacy, providing a springboard and scaffolding for interpretation of our myriad forms of new media. Alright, so you get it: the graphic novel fits well with this not-so-new concept I’ve brought up of emerging technologies. 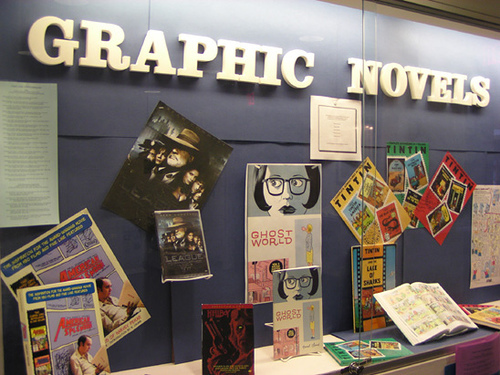 But what, exactly, is a graphic novel? Art Spiegleman, creator of the Pulitzer Prize winning graphic memoir Maus: A Survivor’s Tale, about his father’s experiences as a Polish Jew in the Holocaust, defines it quite simply as “a comic that you need a bookmark for” (Spiegleman quoted in Schwarz 54). 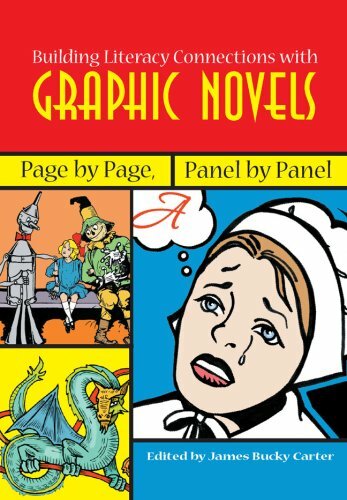 To expand upon that definition, “the graphic novel is longer, packaged as a book, and usually centered on serious material; graphic novels receive critical respect as well as popular notice” (Schwarz 54-55). Though there’s no denying the literary elements present even in comic books (See my post, “Why Spiderman is Poetic”), the graphic novel expands upon this form, breaking out of the bounds of fantastical superheroes and polarized moralities, and focusing on truly life-like characters and the more nuanced realities of life in general. Baird and Jackson, librarians from New York who have published scholarship on the literary form remark that, “a successful graphic novel starts with a stellar story told with words and pictures that augments the story, providing insight that text alone cannot do” (Baird and Jackson quoted in Griffith 182). This combination of words and pictures is what gives way to the interaction of print and image, forcing readers to learn how to comprehend multiple forms of media at once. Since its emergence as a form, many educators have vied for the graphic novel as a legitimate tool to engage both reluctant and remedial readers. Boys in particular, who have at times proven hesitant or unwilling to read much else, have been shown to latch onto graphic novels. Scholars have also noted that sequential art, graphic novels included, can help to assist secondary English language learners (ESL) build their reading skills. Many teachers have found that the form “invites students to review the basic elements of literature…and asks them to apply this knowledge,” while still others use them as a bridge into dense, otherwise intimidating classics (Hart quoted in Schwarz 55). And it’s not only in English classes that the form can be used: teachers have reported success using them in history rooms, business courses, art programs, and elsewhere. In short, “graphic novels can contribute to interdisciplinary thematic units or can serve as an introduction to specific content area,” all the while reaching even the hardest-to-reach students (Bucher and Manning quoted in Schwarz 55). 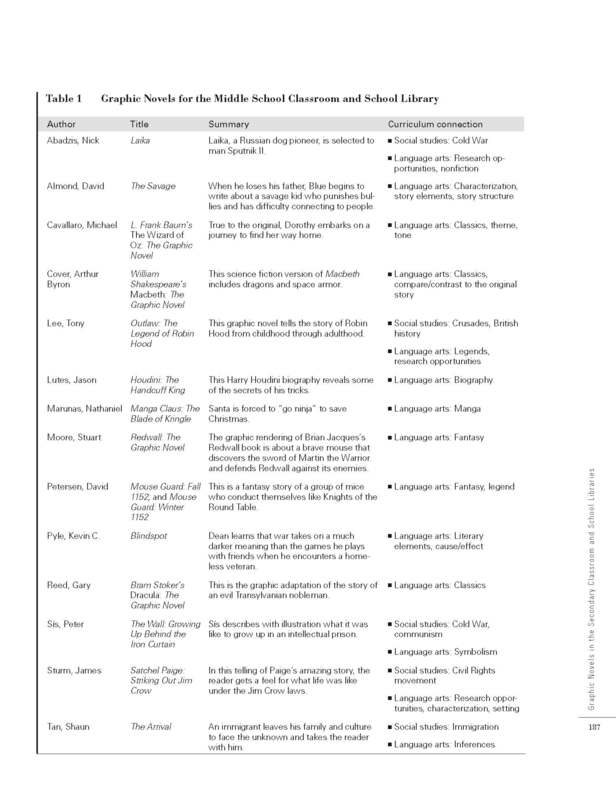 Click here to enlarge and view Griffith's recommendations for graphic novels' connections to a variety of middle school curriculum. All along in our efforts, we’ve been analyzing the graphic novels we’ve picked up in terms of their literary quality in attempts to elucidate and validate their status as a real, accepted, literary genre. So when I ran across a list of criteria for evaluating graphic novels developed by a Doctor of Education with nearly twenty years of experience working in school libraries, I was thrilled, and even more delighted to hear her assert, “these criteria are familiar, but they are listed here to emphasize that good graphic novels contain all the literary elements we expect for quality fiction and nonfiction books” (Griffith 186). And that’s that, folks: graphic novels, as us Graphic Novel Hovel writers have suspected all along, can be analyzed, understood, and studied in the same way as any traditional work of literature. So, without further ado, let me direct you to our page of recommended graphic novels so you can start along your merry way and get reading! Griffith, Paula E. “Graphic Novels in the Secondary Classroom and School Libraries.” Journal of Adolescent and Adult Literacy 54.3 (2010): 181- 89. Academic Search Premier. Web. 29 Apr. 2011. Schwarz, Gretchen. “Graphic Novels: New Sites of Possibility in the Secondary Curriculum.” Curriculum and Teaching Dialogue 12 (2009): 53- 65. Academic Search Premier. Web. 29 Apr. 2011. This entry was posted in Conclusion, Fun and Practical Resources. Bookmark the permalink.